They currently offer a 10% voucher code valid for reservations made until May 5, 2013 (stays until the end of the year 2013). The HotelClub coupon code is Perfect10. The discount is to be applied on top of the payment window, in the section "Promotion code", just above the credit card information. Click on the text code above to see the deal. After their recently expired promotion for £25 per night, Premier Inn continues with good offers, this time slightly higher, at £29 per night (but still a steal). The offer is valid for stays between 26 May and 4 September 2013, when booked at least 21 days in advance. The practical part about it is that once you click on a selected city, Premier Inn will show you a calendar with the rates applicable at each hotel and on each day. So you can adapt your trip to get the best deals (if your trip dates / locations are flexible). The deal is offered by DealChicken, a daily deal website founded by the owners of USA Today. The deal is available for purchase until May 8, 2013, with stays until 1 June 2014 (some blackout periods apply). For bookings until May 1, 2013 (travel until November 20, 2013), Spirit Airlines offers fares starting at 88$ for a round-trip. For example, Los Angeles - Las Vegas in May 2013 is shown at 88$ per person. In addition, when you also book hotels in Las Vegas for a value of at least 250$ you get get a 50$ discount with Orbitz promo code SPIRIT50. Offer including breakfast valid at the Centrovital Hotel****, to be booked by 1 May 2013. As an example, 2 nights over the week-end 5-7 July 2013 have a total price of 88€. That's more than 60% discount from the 235€ charged by booking.com. Travelocity has a special promotion (updated each month), where it shows variable discounts on hotels in Vegas. For example, 4 nights (11 - 15 May 2013) at the LVH - Las Vegas Hotel and Casino (formerly Las Vegas Hilton), have a total price of 245$ from Travelocity. 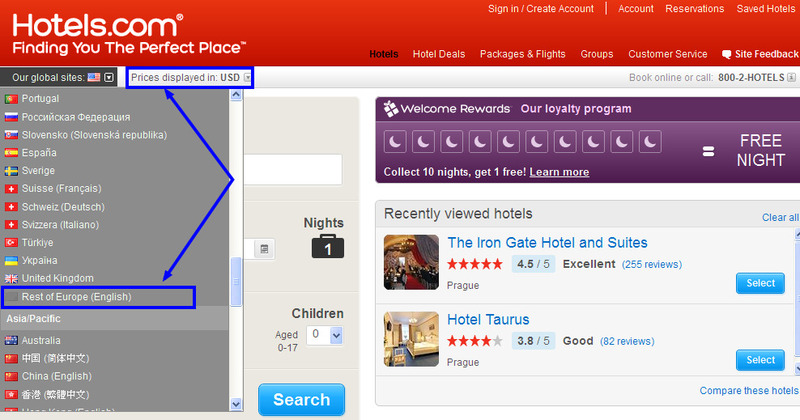 That is a discount of almost 40% from the 381$ charged by booking.com. Shark Reef at Mandalay Bay. - 150$ worth of coupons for dining. Circus Circus Las Vegas "Attractions Package"
Premier Inn is a chain of 600 affordable hotels spread around UK and Ireland. The offer is valid for stays between 17 May and 1 September 2013, when booked until 28 April 2013. Offer including breakfast valid at the Grand Majestic Plaza****, to be booked by 28 April 2013. As an example, 2 nights over the week-end 12-14 July 2013 have a total price of 110€, while the same room costs 216€ on booking.com. Offer including breakfast valid at the Le Meridien Vilnius****, to be booked by 27 April 2013. As an example, 2 nights over the week-end 5-7 July 2013 have a total price of 110€, while the same room costs 230€ on booking.com. 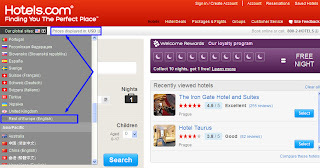 Hotels.com promo code valid for stays until September 30, 2013. The voucher code is to be applied on the right section of the payment page, just below the price detail, in the field "Apply a Discount Code". For bookings made until Friday this week you get £30 discount on car hire in Canada and USA (pick up period until 30 April 2014, a minimum 5 day rental required). The deal is available for purchase until 2 May 2013, with stays until 1 June 2014 (some blackout periods apply). - 40% discount in Africa (stays between 15 May and 31 August 2013). If the offer page is replaced by another page with an error message saying that "You cannot access this page directly", push the banner above again and be careful to stop loading the new page at the moment when the offers have loaded, but just before the error message page appears. You have 10 days to grab this deal. Starting today there is a 10% Expedia promo code for stays until 31 December 2013. The Expedia coupon code is APRILFUN10. Click on the text code to start your search in a new window. 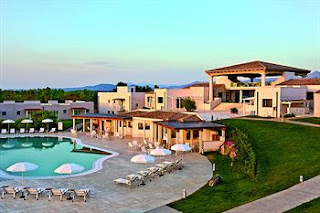 Groupon Ireland has a very good deal for an early-summer vacation in Sardinia. €200 per person for 7 nights on a half-board basis at the 4-star Resort Grande Baia in San Teodoro, some 30 kilometers south of Olbia, Costa Smeralda. This price is valid for stays until 14 June 2013 (after that, coupons are available, but at increased prices). The price includes airport transfers, but does not include flights. Offer valid for purchase until 18 April 2013. We've been in Sardinia during the second half of May last year and the weather was great: above 30 degrees outside and warm sea water perfect for a swim. SWISS Airlines offers attractive fares to the Middle East and Asia for your upcoming holidays. As an example, Luxembourg - Dubai has a total price of 429€ for a return economy flight. Tel Aviv journeys cost 274€, Beijing 500€, Singapore 499€. To see the offers in a new window click on this link. Offer valid for purchase until 24 April 2013 (outbound flights until the end of June 2013). 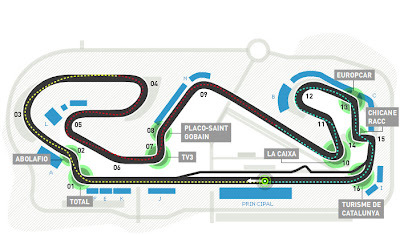 Groupon UK has a very good offer for the upcoming Spanish Formula 1 Grand Prix on the Circuit de Catalunya, just North of Barcelona, during the week-end 10-12 May 2013. - half-board included (breakfast and dinner). - £215 per person for Grandstand J tickets. Offer valid for 2 persons sharing a double room (so two vouchers must be bought). Accommodation on a single use basis is also available for a €50 supplement. The ticket does not include: flights or transfers between the hotel and circuit. The deal is available for purchase until 18 April 2013. For bookings and stays until October 31, 2013, you get 30% discount off all-inclusive rates at the Barcelo Dominican Beach****. To open the deal page in a new window Follow this link. In addition do not forget about the 50$ coupon code we have available here. For example, for 7 nights allinclusive during the period 17 - 24 May 2013, the final price to be paid on Barcelo website is 646$. That is a 30% discount and another 50$ off the 1 078$ charged by booking.com. HipAway just became our favourite Secret Hotels website. 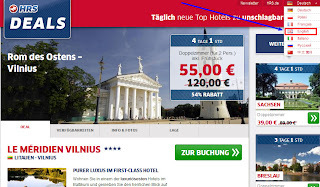 It is a German based distributor of discounted rooms of "secret hotels" (being hotels for which you find out the name of the hotel after purchase - like lastminute.com's TopSecret Hotels, or Priceline's Express Deals). We have already used HipAway to book the 5-star Hilton Budapest Westend for 54€, or the 4-star San Ranieri Hotel in Pisa, Italy for 52€. They currently offer a 15% discount on all hotel bookings made until 30 April 2013 (stays throughout 2013). The HipAway coupon code is 15HOTEL . Promo code valid for bookings until April 24, 2013, for travel until the end of this year. On the right side of the payment page, just below the booking summary, type in the voucher code in the field "Apply a Discount Code" and then push the button "Apply". For bookings until 21 April 2013 (stays throughout 2013) you get 15% discount with the RatesToGo promo code SAVE15. hotel.info is one of our preferred online travel agencies. 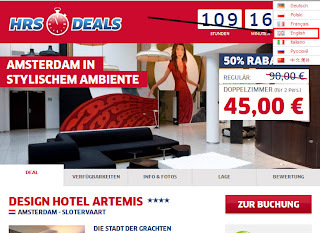 Recently they added a new feature to their website: Super Last Minute offers, whereby for stays within the next days you get significant discounts. 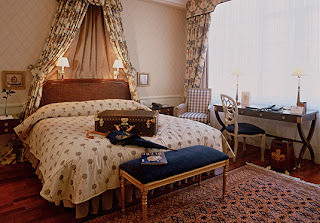 For example, a double room at the Royal Court Hotel in Prague, Czech Republic, for this evening, costs 35 euro, breakfast included. 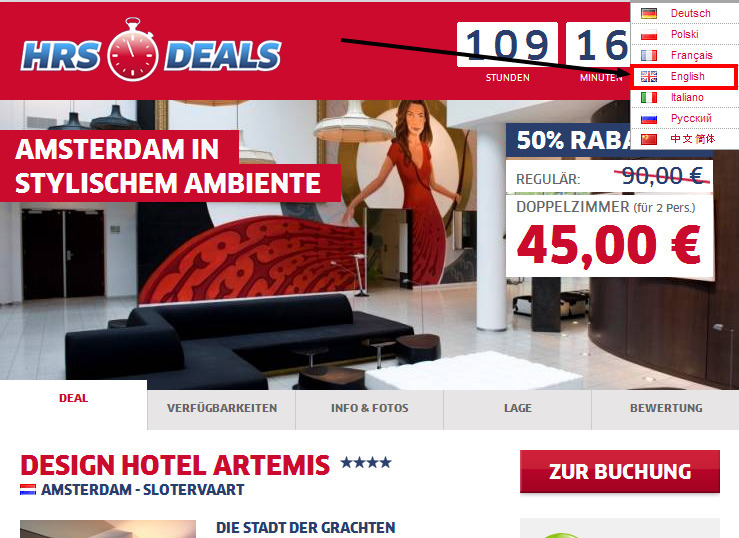 The same room is sold at 90 euro by hotels.com. Holiday Autos (part of lastminute.com / Travelocity group) runs another promotion from 8 to 17 April 2013 (valid for pick-up of the rental car until 30 June 2013). They offer a different coupon code each day, which is valid in a specific country (e.g. on Monday a promo code for Italy, on Tuesday a promo code for the UK, etc.). The coupon is to be applied in the final window of the reservation process, in the section "promo code", just above the credit card information. Offer valid at the Design Hotel Artemis**** for stays from mid May until the end of July 2013. To be booked by 10 April 2013. As an example, 2 nights over the week-end 21-23 June 2013 have a total price of 90€, while the same room costs double on booking.com. They currently offer a 15€ discount on all hotel bookings made until 12 April 2013 (stays throughout 2013). The HipAway coupon code is T646 . Secret Escapes offers a 40% discount on double rooms at the 5-star Stanhope Hotel in Brussels, with free breakfast, free internet and free access to the fitness area and sauna. This offer is available for almost all extended weekends (including Thursdays) between April and August 2013. No minimum stay conditions. Two nights over the weekend 24 - 26 May 2013 have a total price of 170£, being a 40% discount from the 270£ charged by booking.com. You have until 7 April 2013 to book this deal. Best of Orlando, a website specialised in providing competitive rates for Orlando theme parks, shows, attractions, tours, currently offers discounted admission combo tickets to Legoland Florida + Water Park. The discount ranges between 15% and 20%. For example, they sell a 1 day combo pass for 2 adults and 2 children for 254$, while on the official website of Legoland, the same admission costs 300$. The discount code is valid for all hotel bookings of at least 350$ (reservations made until 31 May 2013, and stays anytime throughout 2013). The promo code is SPRING30. As an example: the Swissotel Zurich**** has a total price (after the 30$ discount) of 325$ for three nights over the extended week-end May 24-27, 2013 (see print-screen above). The same room costs 609$ on booking.com. For bookings and travel until December 31, 2013, Orbitz offers a $100 discount code. The offer is valid for stays of minimum 7 nights. The Orbitz coupon code is TRAVEL100 .